In fact, the $3.7 billion jump represents the second-highest quarter of all time and follows on the heels of the industryâ€™s strongest quarter on record, which was $21.6 billion in the fourth quarter of 2016.
â€œThese figures reflect marketersâ€™ ongoing commitment to invest in digital,â€� said Chris Kuist, SVP of research and impact, IAB, in a prepared statement. â€œThis steady growth is a direct result of interactive advertisingâ€™s power to reach consumers where they are spending more and more of their time â€” on connected screens. 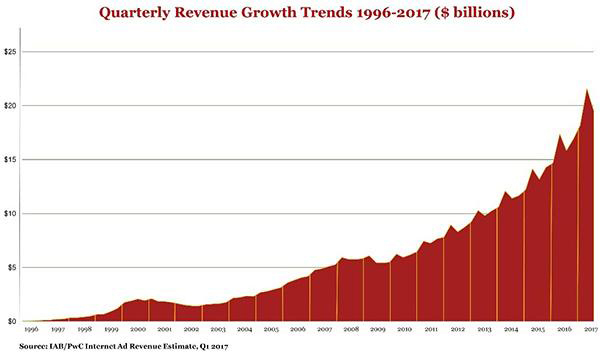 â€�The full report is issued twice yearly, and top-line quarterly estimates are issued for the first and third quarters, per the IAB. Copyright 2017 MediaPost Communications. All rights reserved. From http://www.mediapost.com. By Laurie Sullivan.